Have you ever wanted to play Starcraft but are unwilling to spider your fingers across your keyboard hundreds of times per minute? Are you interested in the complexities of trying to figure out your opponent and adapt before they do? The brilliant Pocketwatch crew behind Monaco have released their newest game and it looks to fill the accessible RTS void. RTS games have always been some of my favorites but I just don’t have the dexterity to keep up with people doing 3-400 actions per minute. 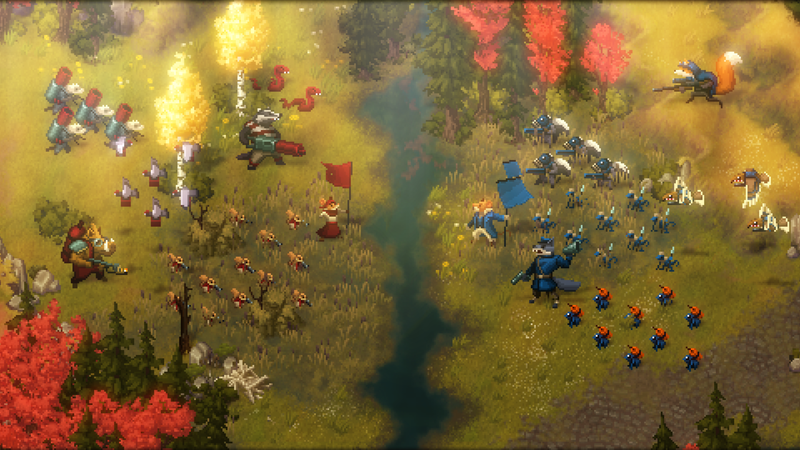 Fortunately Tooth and Tail takes all of the best elements of the genre (mind games, planning/execution, and adaptable strategies) and distills them into 10 minute chunks. There’s also a fantastic single-player campaign with an that really highlights the game’s incredible visual design. Well Smith is back on his grind with this week’s release of Freeways. Sporting Captain’s trademark Microsoft Paint aesthetic, you’re tasked not with insurance fraud but with becoming the most haphazard city planner. You’ll feel the excitement of drawing freeways with your meaty fingers. You’ll know the drama of city congestion because your fingers are just too meaty. You’ll even experience the comedy of seeing small cars drive around on inappropriate shapes you’ve drawn. Freeways has something for everyone and is available now. I love pixels. I love them to death. HD sprites are great, low-res art is great, I’m here for all of it. So when I saw Dark Devotion I was ready. Sure, this isn’t a full game -- it’s a demo released alongside a Kickstarter campaign-- but it’s certainly worth a playthrough. The art is gorgeous and the combat is suitably chunky. I can’t speak to what the final build of the game will have in store but this demo inspires confidence.